We performed spectral inversions using ground motion data observed by K-NET, KiK-net, SK-net, and the earthquake observation network of the East Japan Railway Company in the Tokyo metropolitan area, Japan, to evaluate the effects of site amplification factors of both S- and P-waves for the future use of an on-site earthquake early warning system based on predicted S-wave amplitudes from observed P-wave amplitudes. The source and path effects from the inversions were similar to those estimated by previous studies. The spatial distributions of the site amplification factors of the S- and P-waves depend on the geological conditions, especially for the S-waves. The site amplification factors of the S- and P-waves nearly agree with those calculated with a 1D reverberation theory using existing velocity models from KiK-net. The site amplification ratios of the S-waves to the P-waves show a decrease in the amplitudes at frequencies greater than 2–5 Hz, especially on the plateaus and in the coastal areas covered with thick soft layers because the site amplification factors of the S-waves are small in this frequency range and those of the P-waves are nearly constant over the entire frequency range. Further, the remarkable peaks of the site amplification factors for the S-waves are preserved in the site amplification ratios of the S-waves to the P-waves at sites in the valleys and on the boundaries between the plateaus and the lowlands. The authors thank an anonymous reviewer for their useful comments. 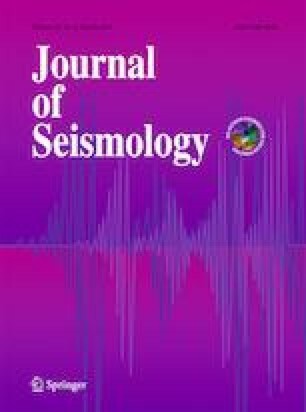 The authors thank NIED for providing us with the earthquake data and the velocity structures of K-NET and KiK-net, the moment tensor solutions of F-net, and the engineering geomorphologic classifications of J-SHIS. The authors used the earthquake data of the Tokyo, Kanagawa, Saitama, Chiba, Ibaraki, Tochigi, Gumma, Shizuoka, and Yamanashi Prefectures, the Tokyo Fire Department, the Yokohama City, and ERI, the University of Tokyo, through SK-net. The authors also thank Weesel and Smith (1998) for providing us with Generic Mapping Tools (GMT).